3 Easy Ways to Subscribe! 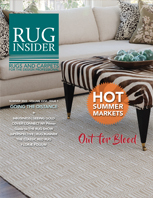 Subscribe now to start receiving your print edition of RUG INSIDER magazine  covering every rug construction, style and country of origin through its mix of fun, provocative and entertaining articles and news. Each quarterly issue is brimming with up-to-the-minute trends and the newest products available. RUGINSIDER.com may contact me via email regarding special promotions, news and events.